"One should only practice on days that he eats!" At home, YOU are the teacher! Never "play until . . . ."
Most everyone probably understands that it is important to train and practice if you want to become a good football or tennis player. Playing a musical instrument is a physical skill which requires training and development just like any sport. Developing the necessary discipline and concentration for regular practice is a very difficult skill to learn for any musician. Music teachers often wish that they could be at home for each practice session to help out! But did you know that at home, the student will become the teacher?!! Most students probably don't know HOW to be a teacher yet, so guidance from a parent or older guardian can be of great help. See article on "10 Ways Parents can Help" (the next column to right, or at end on tablets/mobile). Did you know that we all have Super Brains?!? Bet you didn't know that our brains are SO smart, that they will REMEMBER anything you consciously put into them! That includes mistakes, too! If you play a section wrong, it takes SEVERAL repetitions (maybe even 100's!) of playing that section CORRECTLY to "erase the mistake in your brain." It's sort of like having to walk MILES and MILES in order to burn off the calories of eating 1 chocolate chip cookie!!) Make sure you put the information (music) into your brain CORRECTLY the FIRST TIME, to save hours and hours of practice simply FIXING your mistakes! Every student should write-out a daily schedule of times which are available for practice. Parents of younger students can help in this project. Post this schedule on the piano and/or in a "public" place for all family members to see. Students should observe this "Practice Appointment" just as you would a Doctor's Appointment. (Truthfully, it should be a LOT more fun than most Doctor's appointments! If it's not, perhaps we should examine practice techniques, expectations, or other outside activities and conflicts.) The ideal time to practice is immediately after the lesson. (That same day, or the next day at the latest.) Ideally, practice schedule could be divided between early morning, when you are the freshest, and afternoon or evening. What is a good "order" of practice? Jack-in-the-Box Games ("think outside the box" ... try to get the brain involved ... Try playing the LH alone from memory, try playing one measure, then singing the next, try playing "opposites" ... if it is legato, try it staccato, if it is with pedal, try it without... try playing backwards by section! .... play the LH part using the RH, or vice-versa... try playing a melody or melodic passage using only your 2nd finger. TEMPO to avoid making mistakes or stumbles. metro, then COUNT ALOUD while you are playing. 5) Drill hard spots of pieces extra. Retrain your brain! Isolate the tricky spots and drill extra, at a slow speed, then gradually increasing the tempo. Then, put this small section back into context by adding a measure or 2 before and after. 8) When in doubt, contact the teacher. 5) End with "review pieces"...save the best for last. 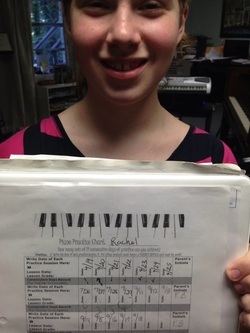 Now is a good time for a "practice performance" if you are getting close to a recital or audition. ​Quality over Quantity . . . . The length of each practice session should be suited to each student's age and level of advancement. For a child beginner, age 4-5, a daily 15-20 minute practice session (or 2, 10-minute daily sessions) should be sufficient. For beginning students ages 6-8, you may need 20-30 minute practice daily sessions (or 2, 15-minute daily sessions, or 3, 10-minute daily sessions) in order to complete the practice assignment. Students age 8-10, might aim for 30-45 minute daily sessions, and students ages 10/12-18 might aim for 45-60+ minute sessions. The serious, more advanced piano students who generally win the piano competitions and are able to perform the advanced literature, usually practice several hours each day. 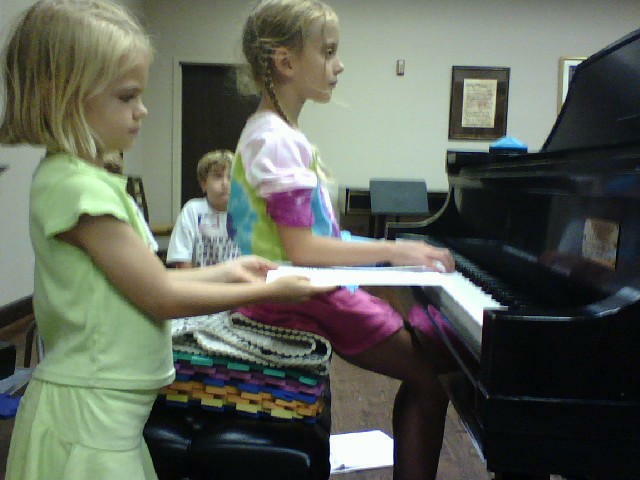 Many college music majors and concert pianists practice anywhere from 4 to 9 hours daily. Obviously, as the pieces and assignments become longer, more practice time will be necessary. Parents and students often express concern about successful home practice. Developing the necessary discipline and concentration for regular practice is a very difficult skill to learn, so here are a few practice tips to help guide you! Perhaps we should first start with what practice is NOT. Practicing is not the same as performing. Successful practice involves setting specific goals for each practice session. Practice is not simply "playing through" a piece of music until you make a mistake. Finally, practice is not necessarily about quantity ... but about quality. The old adage, "practice makes perfect" can be misleading. Simply spending time with an instrument is not enough. In reality, only "Perfect practice makes perfect." The quality of performance reflects the quality of practice. So scroll down to see how you can accomplish more in less time and guarantee satisfying, polished and enjoyable music-making experiences for a lifetime! 1) Ensure that your child is regularly present at lessons AND at the regular special events and group musicianship classes. This is necessary for effective progress and continuity of instruction. Otherwise, it is a waste of time for you, your child, and the teacher. Be sure that all music books and materials are brought to each lesson. 2) CHECK OVER THE PRACTICE ASSIGNMENT. Review the practice assignment daily, and help the student complete the practice chart. Initial at the "Parent's Initials" on the 21 CD practice chart in the assignment notebook prior to each lesson to verify their practice totals. The written assignment sheet will include a list of items to be included in each week's practice. If you're not sure of what is expected during practice just e-mail the teacher. Your child will probably enjoy playing old pieces and just "fooling around" with music. This kind of experimenting and improvising should not necessarily be discouraged BUT SHOULD BE IN ADDITION TO practice of the assigned pieces. Go through EACH music book as well, to make sure a particular assignment was not accidentally left off of the student assignment sheet. 3) Help the student organize the practice session. A final tip for parents, if you see that a particular piece is being reassigned for several weeks or months in a row (with the exception of recital/festival pieces which are longterm assignments), then there is a need for more effective practice. Help guide the student through the teacher instructions in the music and on the assignment worksheet. 5) Prevent distractions during practice. Your child will be able to concentrate and gain more from practice time without interruptions from phone calls, friends, brothers/sisters, pets, TV, stereo, loud conversations etc. Be firm and consistent - - - your child (and his friends) will respect you for this. Provide a successful learning environment. Always sit correctly! The bottom of the elbows should be level with the tops of the white keys. 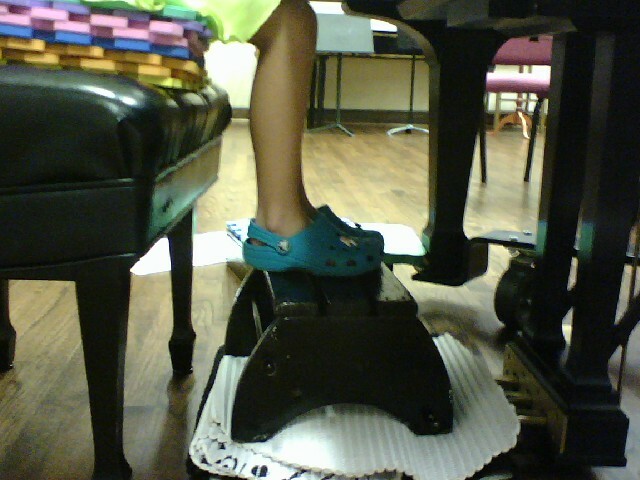 Students should not sit too close to the piano. A footstool should be provided if feet cannot reach the floor (feet should not "dangle"). Carpet squares make wonderful (and cheap!) seat height adjustments! 7) LISTEN AND SHOW YOUR INTEREST. All it takes is 5 minutes of your UNDIVIDED ATTENTION, a few times each week (turning off the TV, putting aside the newspaper, stopping work in the kitchen etc.) Motivational studies show that children progress faster and derive greater benefit from their lessons when parents show a genuine interest in the music study. Both parents. It really doesn't take long and it gives you and your child an opportunity for a little "private time" together. This will help develop self-sufficiency and self-motivation in practice. Encourage your child by showing an interest in the music he/she plays, expressing appreciation for and admiration of his/her efforts and praising him/her for improvement and achievements. Plan opportunities for your child to play for family gatherings, especially when these gatherings precede a piano recital or other performance. However, do NOT insist that he or she publicly perform a piece that is unsure, as his failure to play well could mar any future enjoyment he might derive from performing for others. 8) When in doubt, contact the teacher. If you have any questions about lesson assignments or practice procedures, or want to discuss your child's progress or special concerns please feel free to set up a time for a private telephone conference. Of course this should be done at a time when your child is not able to listen in. Always consult the teacher before giving musical help to your child. There are many "traditional misconceptions" about piano technic which are having to be countered with in this 21st century (such as the fallacy of "playing with curled fingers" or "holding a bubble/orange/ball" etc.) Please feel free to e-mail the teacher if you are ever in doubt as to whether your suggestions at home may not compliment the explanations presented in the lessons. 9) Provide a well-maintained instrument. The keys, pedals, bench etc. should work properly. Tuning is extremely important for a piano. If the piano at home is out of tune a child's ear may be confused when playing on the teacher's piano. Ideally, the piano should be tuned twice a year or as the seasons change. Late fall (about Thanksgiving), after the heating season is well underway and late May/June are usually recommended. The stability of tuning is affected by temperature changes, drafts, and humidity. Therefore try to avoid placing the piano on an outside wall or near a poorly insulated window, radiator, heating duct, or air conditioner. During winter months a room humidifier may be desirable if humidity drops below 20%. The most common mechanical keyboard problems are keys that stick or don't work, and pedals that squeak or don't work. The cost of such repairs is often modest. The best time for repairs is during a routine tuning, and the technician can usually tell you in advance the approximate cost. If major repairs are suggested it is a good idea to get a second opinion. Here are some wonderful piano tuners/ technicians in the Birmingham, AL area. *Kirk Alford, *Mike Reese, Mike Marsh (205-681-1932), *Gary McCormick (*Registered with Piano Technician Guild) and the technicians at Ellis Piano and Alabama Piano Gallery. 10) Finally, realize that PLATEAUS are as normal in musical learning as in any other type of learning. All students will go through 'plateaus', where progress seems to be at a standstill. During these times, help your child learn to be pleased with the "small" progress and be patient with the "slow" progress. Remind him or her of how subtle their own physical growth is! They may grow several inches a year but they cannot visibly SEE this growth, even though it's definitely happening! Remind them how far they have come already in their musical development! At one point it was hard for them just to push down a key or draw a quarter note!